A comprehensive size range of tapered corks. 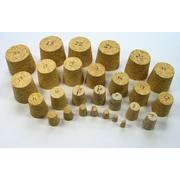 From tiny cork stoppers for small perfumery bottles to larger Bungs or Cork Lids for that biscuit barrel or sweet jar. So whatever you need a stopper for - bottles, perfumery or even party favours, we should have the ideal one for the job.